We ask that you please arrive for your appointment 30 min before your scheduled jump time. Your tandem instructor (who you will be attached to) will give you a brief demonstration of exactly how your skydive will work and what you need to do. 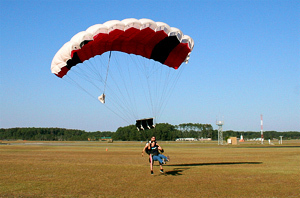 You will also need to complete the necessary paperwork prior to your skydive. No prior experience necessary and no major training involved. Your experienced instructor does all the work. You just have to sit back and enjoy the thrilling ride. Your skydive will be from a breathtaking 9000 feet. 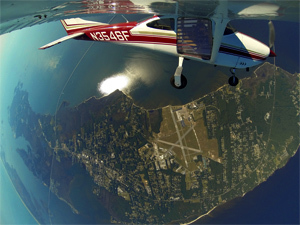 You will experience about 30 seconds of freefall before your canopy opens and you glide slowly over the amazing scenery of the Outer Banks. You will land in an open field close to where you checked in with us at the Dare County Airport in Manteo on Roanoke Island. There is a spectator area by the landing field so your friends and family can watch and take photos/video of your safe landing. After your skydive is complete, we will present you with a Certificate of Achievement for your successful first jump. If you opt for the DVD/video of your skydive, we can have that ready the same day. Also visit our prices page. To book your tandem please give us a call: 252-678-JUMP.